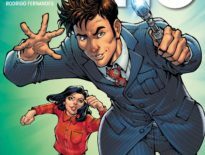 It’s a real joy to see Leandro Casco back drawing the Eleventh Doctor and co.; with colourist, Rodrigo Fernandes, the pair make this ninth issue of The Eleventh Doctor‘s “Year Two” a vibrant, fun, and all-together very pleasing comic. Writer, Simon Spurrier gives them plenty of stunning ideas to visualise: we have Lujhimene, a planet (which looks rather like a giant conker) cut in half by the Time War’s time lock; a brief glimpse of a Dalek city; the Malignant; the Then and the Now, dragging a passenger along with it; the Master’s TARDIS; and Alice Obiefune, the Doctor’s comic companion, shooting down a fellow time traveller. Yep, this issue packs a punch, even if it feels like a sort of bridge between two parts of the ongoing arc. Last time’s cliffhanger promised a showdown with the Malignant, but we don’t get that yet – instead, the pay-off is the creature attacking River Song. The TARDIS has felt somewhat cramped recently, but Spurrier and Rob Williams (who helped plan the story, and is writing alternate issues) have made that work, and from the looks of it, they’re slowly cutting them down until we’re presumably left with just the Doctor and Alice again. That’s where I think this is heading: the Doctor’s got this far with the help of Alice, River, Dalek-killer, Abslom Daak, and the Squire, a companion from the Time War that he can’t even remember; the conclusion of “Year Two” could very well be him relying solely on just one of them again. And it’d be most interesting if that one companion is Alice, the one he’s been particularly – and unnecessarily – harsh to. Nonetheless, Alice is proving herself to be a very able and considered friend to the Time Lord, and if the cliffhanger is anything to go by, she’s doing something no other companion has before. It’s fascinating territory for both her and the Doctor. 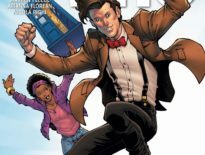 The Eleventh is a seemingly care-free Doctor, hiding all that hurt and darkness under a friendly façade: Titan Comics’ arc is reminiscent of Matt Smith’s final three serials in that he has to come face-to-face with the Time War again, years spent being something other than ‘the Doctor.’ Seeing how he handles that drives this series on, and Spurrier does well to maintain the Doctor’s kind and jovial nature, even when he’s having to recall his darkest hours. Well, the Squire. She’s back, I’m pleased to say. She’s a great concept and her characterisation, loyal to her Doctor even if he’s not been sure whether he could trust her in the past, is brilliant. It was a shame to see her unceremoniously leave; the Doctor appeared to have offended her, so off she went – except this issue shows that wasn’t quite the case. Sadly, she’s been injured by the Then and the Now, and I’m not sure she’ll make it out the other side of this series. This is a reflective tale, drawing on a couple of plot threads from previous issues and giving Casco the chance to play with the Doctor’s timeline: in the presence of the Then and the Now, his form shifts between incarnations, and Casco captures each face perfectly. In one panel, we get to see portraits of the Doctor’s companions, framed on one of the TARDIS’ walls, including Sarah Jane, Rose, even Mels, and Clara Oswald – someone the Doctor hasn’t met yet. (“I exist across all of time and space,” the TARDIS said in 2011’s The Doctor’s Wife, “and you talk and run around and bring home strays.”) Those little easter eggs from Casco make this issue a very layered one. 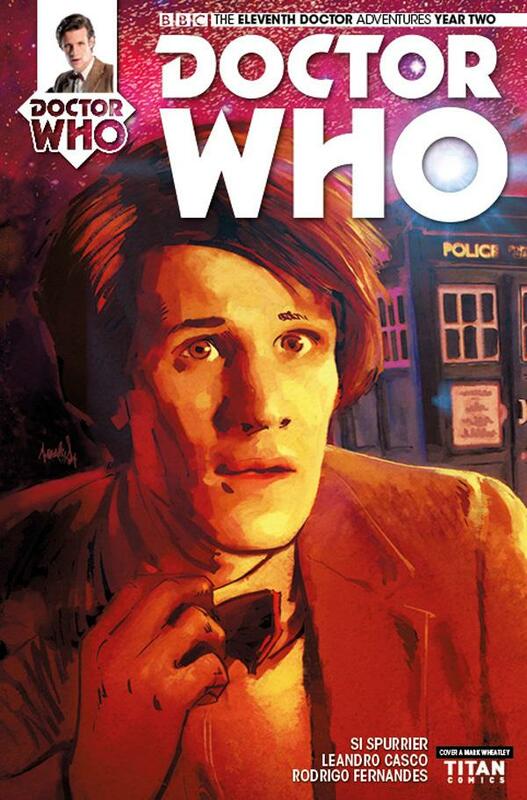 That’s all topped off with a great cover by Mark Wheatley, almost an impressionist take on the Eleventh Doctor. 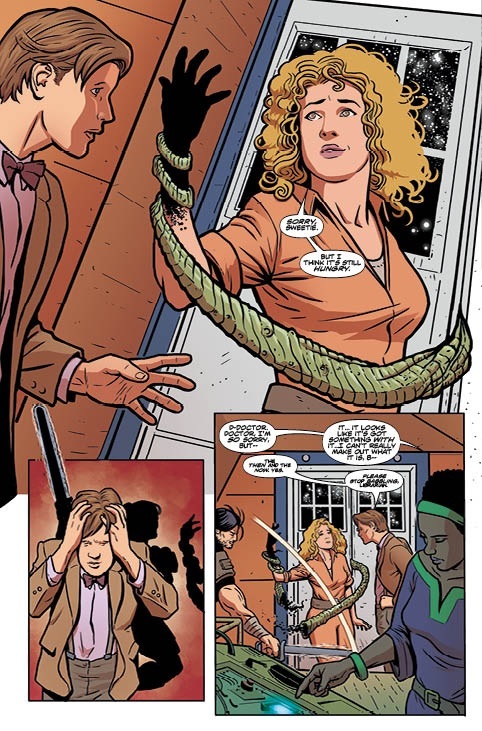 And the lasting impression of The Eleventh Doctor #2.9 is a great one. The Eleventh Doctor #2.9 is out now, priced $3.99.